We carefully studied the profile of an original N type factory water jacket plate when developing this project. 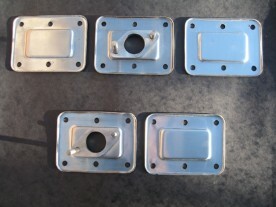 These water jacket plates are 100% stainless steel, i.e. this also includes the manifold diamonds and the BSF studding. We also used the outer profile of an original bronze water manifold to produce an identical base profile on the corresponding diamond plate. This product is exclusive to Vintage MG Parts and we offer a lifetime guarantee on this part. These plates are supplied in a lightly brushed finish and can be sprayed with an etching primer and then painted, or highly polished or more generally, left as is with a smart shiny finish. In addition to the above, we also supply stainless steel hex head set bolts and washer sets to complement these water jackets. Rotting water jacket plates, shearing off of bolts in the block, drilling and retapping will now be a problem of the past. We also stock nitrile rubber gaskets for the P Type and L/K/N Type to complement this set. The outer rubber profile has been drawn up to perfectly match the machined block face to eliminate any untidy overspill of the gasket itself and the scew holes are all cut undersize to assist sealing. Nitrile rubber gaskets are resistant to the petrol ethanol additive problem which is becoming a progressive issue in the continued running of vintage cars. In addition, nitrile does not deteriorate with age. We also stock Wellseal jointing compound.